Clinicians caring for patients across many clinical units typically operate in silos, or in isolation to each other. As a result, teamwork is not cohesive and deficiencies in communication and information sharing between clinicians can occur. This may lead to delays in the provision of care, an uncoordinated approach to care planning, a poor patient experience, inefficiencies in patient flow and an adverse impact on patient safety. 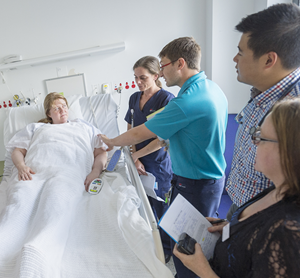 Clinicians working as unit-based interdisciplinary teams have demonstrated improvements in communication, patient safety and staff satisfaction. The patient's experience is enhanced by bringing patients together according to their diagnosis and caring for them using an integrated approach. This encourages active involvement of the patient and contributes to improved patient outcomes and more effective care coordination. The In Safe Hands program provides a platform for building and sustaining efficient and effective healthcare teams within a complex healthcare environment. It enables teams to address daily challenges of patient care and empowers them to make good decisions based on understanding the full scope of a patient's care. All members of a healthcare team are then better placed to solve problems as they arise. Promotes a shared mental model (shared understanding) for care, ensuring that all members of the team have the same understanding of the care that is required. The program supports the NSW Ministry of Health's Whole of Health Program. * SIBR was created by Dr. Jason Stein of Emory University in Atlanta, Georgia and is a registered trademark of Centripital, Inc. Any commercial use of the mark without the express written consent of Centripital is strictly prohibited. For more information, please visit www.centripital.org.